What Is DA Form 137-2? DA Form 137-2 or the Installation Clearance Record is a form used during preparing for a permanent change of station - or PCS - and clearance verification before transitioning from active duty, transferring to another installation or retiring from the Armed Forces. The DA 137-2 is used to ensure that all debt to the government and its instrumentalities is identified and that the necessary actions are taken to obtain those payments before retirement or transfer. The most recent version of the form - sometimes confused with the DD 137 Forms - was released by the Department of the Army (DA) in February 2015. An up-to-date DA Form 137-2 fillable version is available for download and digital filing below or can be found on the Army Publishing Directorate website. The 2015-issued version is unclassified and approved for public release with further distribution unlimited by the law. Section 301, Title 5, USC. before the Soldier's transition from active duty, separation or retirement. Forms will not be disclosed outside the Department of Defense (DoD) and DoD sponsored agencies. Disclosure is voluntary; however, failure to complete this form may result in only partial payment of final pay. your final pay pending verification by DFAS of any outstanding debts. Activities marked with an @ require clearance for all Soldiers separating or retiring from the Active Army, including AGR personnel. final military pay appointment. Separation payments will not be released until installation clearance is completed. Provide any additional information in Remarks, block 16. 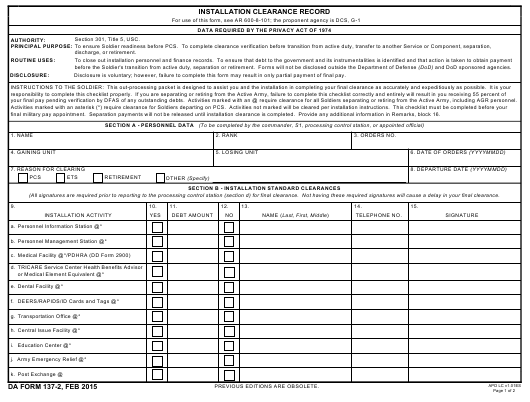 (All signatures are required prior to reporting to the processing control station (section d) for final clearance. Not having these required signatures will cause a delay in your final clearance. Filing guidelines and additional information on the DA 137-2 can be found in the Army Regulation 600-8-11, Reassignment, released in May 2007. Make sure that you have read the instruction carefully before completing the form: failure to complete the form will result in it not being accepted, which - in turn - will result in a partial payment of final pay. Section A, Personnel Information, is mostly self-explanatory. Enter your name, rank and orders number. Identify the gaining unit, the losing unit, the date of address and departure date. Section B, Installation Standard Clearance, is for specifying if you have any debt and providing amounts of those debts. All signatures in Section B are required prior to reporting to the processing control station (Section D) for final clearance. Not having the required signatures may cause a delay in receiving final clearance. Section C - Military Pay Processing - is devoted to Military payment clearances. Section D, Processing Control Station, is signed after collecting all other signatures. DA Form 137-1 or the Unit Clearance Record is another form used to ensure a soldier's readiness before a permanent change of station, transitioning from active duty, transfer to another service or component, separation, discharge or retirement.